Farol Ltd are now proud dealers and stockist for the range of AVANT Tecno compact implement carriers. These articulated telescopic machines are an excellent all-round solution for applications where compactness and versatility are key. There are over 200 attachments available for all your needs, from equestrian and forestry to construction and farming. We hold stock of 5 chassis sizes ranging from 20hp to 50hp including the fully electric e5 model, perfect for indoor working areas or low emissions zones. 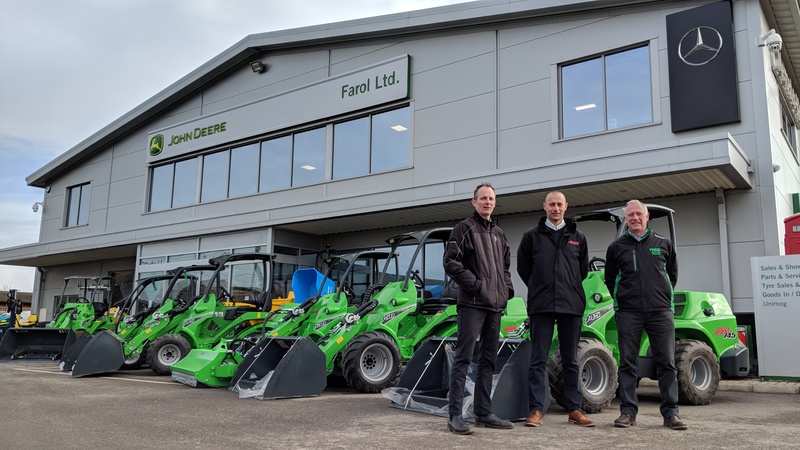 Avant have been producing compact loaders for the last 25 years and the franchise makes a great addition to the Farol Ltd machinery portfolio. Photo: Kerr Stephenson (left) and Peter Helps (right) meeting with Avant national sales manager John Spencer for the official handover of our first delivery of machines.